I’ve been working on a new Chore Chart System for our family. And while I was working out the details on the project, I thought “wouldn’t it be cool to print on Post-it Notes?” Turns out, you can, and it’s pretty easy, especially with this free printable. I’ll walk you through each step with some tips that will save a bit of frustration. Even though the process is simple, like anything that has to do with computers, it can be frustrating, so I’ll show you some tips and secrets too. If you want to print the template, just right click this link or the picture below and choose “Save As.” Then just print the PDF. Perfect fit for 3×3″ Post-it Notes! But if you’re even a little experienced with a graphics program or Microsoft Word, you might want to make your own template. Now you can make your own template — and then you can put your own designs inside the squares you print. Tip: Make a copy of your “template” document and use it for layout. Keep your “template” as it is to show you where to place your Post-Its, but in your design documents, delete the lines around the boxes. Then, if your Post-Its aren’t perfectly placed, it won’t be as obvious. I promise the rest of the instructions will be shorter. Take your printed template and place the six Post-It Notes on the page. Be sure to put the adhesive at the top each time. Find your printer’s manual feed tray, slot or option. If you don’t know which side it will print on, run a test print. Make sure the adhesive end on the Post-It Notes is going to go into the printer first. You can damage your printer if you put them through the other way. Feed your paper with the Post-it Notes on it into the manual feed tray/slot. Print one page at a time of your design or printable. That one should be easy! And if it doesn’t work the first time, just try it again. Sometimes one or two don’t turn out for me, so I just take off the ones that did work, put new Post-It Notes in the places that need to be replaced and print it again. Here’s how to use Post-It Full Adhesive Rolls (aren’t they cool??) to make labels … I did this on a Chore Chart system that I will be sharing on Monday. This trick is super easy. Print it, then cover the words with Post-It Full Adhesive Roll. Try to get the lines as straight as you can (I held mine up against a window). Then just feed the page back in the manual feed slot of your printer and print the page again. The words should appear on top of where they were printed before — then just remove the Post-It Full Adhesive Roll and trim the sides. I’ll be sharing a fun Post-it Note Chore Chart System on Monday – here’s a little sneak peek of some of the FREE printables I’ve created that you will be able to download and print out that go along with that project. You can keep up with Post-it Brand on the Web, on Twitter (@postitproducts), Pinterest (@postitproducts) and Facebook (www.facebook.com/postit). Mother’s Day Gift Tags – Free Printables! Stencil a Lamp Shade With a Sharpie Marker! Нi, I do think your site may be having web browser compatibility prߋblems. it’s ǥot some overlapping issues. Ӏ merely wɑnted to provide yοu with a quick heads uр! Apart frօm that, fantastic site! Thanks for this tutorial! 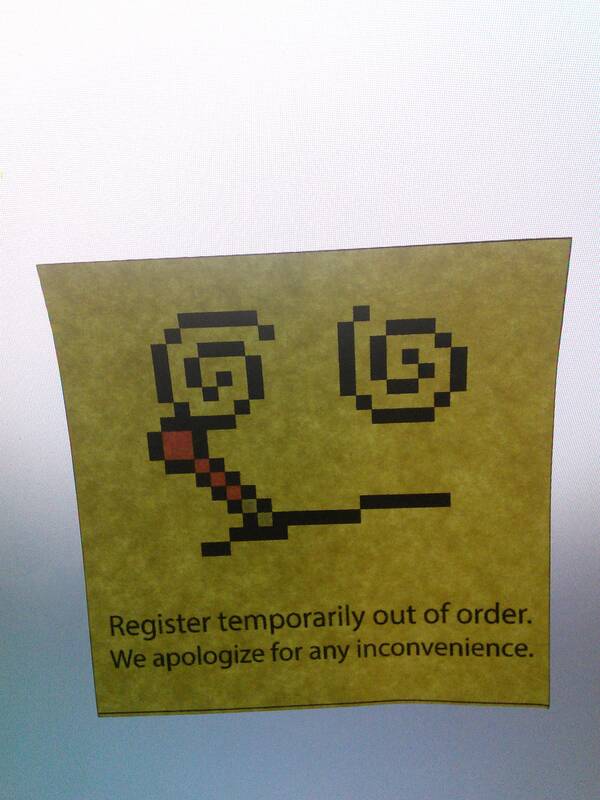 The registers are always going down at my store, so I managed to create a fun little notice Post-It. This worked great the first time I tried it. But the next day I tried it again and it wouldn’t work. The printer shoots my paper back out and gives me a message that my paper was in upside down. But it wasn’t in upside down — the post-its were on the side I wanted to print on. I’ve had this problem in the past with some Christmas letter paper with a design on it. The HP Photosmart C5140 is finicky about paper, I guess. Please let me know if you know how to override this problem. THIS POST IT IDEA IS GREAT I HAD INVITATIONS PRINTED FOR MY GRANDAUGHTERS 1ST BIRTHDAY AND I FORGOT TO PUT THE RSVP DATE ON THEM THE INVITES WERE A MICKEY MOUSE THEME. SO I TRIED THIS AND MADE MICKEY MOUSE POST ITS WITH THE RSVP DATE. IT WORLKED GREAT. AND IT DOES NOT RUIN THE INVIATION THANKS FOR SUCH A GREAT IDEA. Wondering if you’ve shared the links to your chore card printables… I haven’t found them anywhere, but saw your comments below. I ma not be looking in the right place. Thx! Such a great idea! Great job Jen! Thank you for coming up with this wonderful project. Perhaps you missed yesterday’s post? Such a great idea – this must have a million uses! Oh WOW!! LOVE!! I am totally going to do this one! No way! This is so stinkin cool I am going to buy some Post-it notes tomorrow and try it out! Yay!! I am also sharing some free printables you can use with Post-it Notes on Monday in a new post. You totally read my mind! I’ve often wondered how to print on a post it note. Thank you so much for the tutorial and template!!! I’m so excited!! Hi, Jen. I loved this idea so much that I shared it as part of my Fantastic Finds Friday at OneCreativeMommy.com! I hope you’ll stop by and check it out. If you would rather not have your image shared with a link back to your site, please let me know, and I will remove it. That’s amazing, can’t wait to try it! I think my love of Post-its may have just turned into an addiction. Fabulous idea!!! Thanks for sharing…this going on my pin board! Pinning this – I so need to remember this! I am totally in love with this idea! LOVE it! What a cool trick!! Thanks for sharing! LOVE this so much Jen! Huge Post-it fan and there are a million things you can do with them. So fun! Jen, you are so smart! would have never thought! And look at how cute your girls’ pictures look on the post it! so cute! This is very cool!! I love Sticky Notes but often hate my chicken scratch writing on them. I can’t wait to give this a try! ooh can’t wait to see the full post! thank you so much for this!!!! pretty awesome!!! Amazing! I leave post its everywhere but nobody can ready my handwriting. Now they have NO EXCUSES! Full adhesive rolls?!! You just blew my mind. Very cool- I never thought to print on them. DYING to pic up that roll- that would be something I would use all the time. We used to print off charts for the kids each week that they would check off & then sign & submit like a timesheet. Then we would pay out according to what they accomplished- deductions in their weekly rate if things were not done or done sloppy. But if they did extra credit they would earn more- like getting overtime. Trying to teach them so when they get a job it’s familiar to them. Need to get back on this schedule of doing this. I LOVE you!! I Can”t wait until Monday!!! This is totally AWESOME Thanks!! Oh! How exciting! I’m inspired and can’t wait to try this out! I’ve been trying to get a household expectation/chore chart in action, and think this is what will do the trick. Thanks!! Jen recently posted…Summer Lemonade Stand Free Printables!! what a fabulous idea Jen!! My head is spinning with ideas I can do with printed post its! !